Mainly used to analyze the O2 and CO2 contents of CA storage rooms. 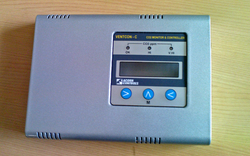 It uses digital display, and is straightforward , precise, stable and quick in response. - Range: co2: 0-2000/5000/20000 ppr, %rh:0-100 %.temp:-20 to 60deg.cel. - Accuracy: co2:+/-40ppm+3% reading %rh: <3%, temp: 0.2 deg. cel. - Response time : co2: <5 min.for 90% change at low duct air speed %rh :<5 sec( 90-99%). - Duct air speed: 0-450 m/min. 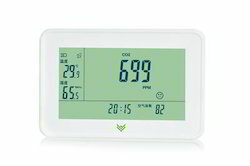 From our wide range of products, we are offering high quality Carbon Dioxide (CO2) Sensor that is widely used in Modified Atmospheres, Ripening Chambers, Indoor Air Quality systems etc. These sensors are manufactured using the finest quality by our skilled engineers. Usage/Application: Demand Control Ventilation in schools,office buildings,hospitals and other indoor environments.